Do you have pioneer ancestry? Founders of Australia (A. Kenyon. 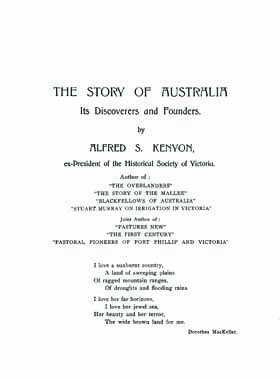 c.1937) is two books in one volume - a valuable account of exploration and foundation of European settlement in Australia, together with a fine record of many pioneering families. The Story of Australia: Its Discoveries and Founders - This surveys the search for and exploration of Australia, the coming of the English and early settlement, home rule, the story of sheep, the era of gold and more. The and their Descendants - This is a goldmine of information! This section consists of over 530 pages of biographical details of many of the early pioneering families, mainly from South Australia and Victoria. Each biography is several pages long, and often includes photos. Each gives details of the emigrant’s and how they came to Australia. It also tells of their family and occupations, where they lived, or owned land and much more. Sometimes details such as death (date, place, cause), education, extended family members, neighbours, friends etc. are also included. This is a great genealogy tool for anyone exploring their family history or building their family tree.